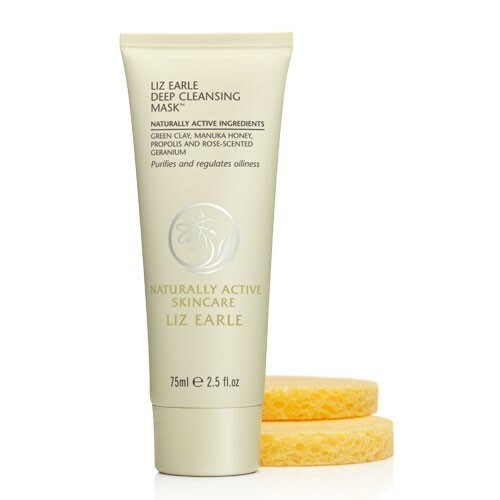 I was really very impressed with Liz Earle’s Deep Cleansing Mask when I gave it a couple of tries last week. Despite the fact that I think it smells a little bit like black olive tapenade, I like it a lot. It did an excellent job of banishing oil and balancing out the skin, leaving it feeling toned but not too tight. It also managed to single-handedly destroy three spots without making them angry first. The very next morning, they were gone – just a little tiny patch of dry skin in place of each former pustule. Now I say ‘single-handedly’ but I will put my hands up and admit that there was an extra product involved here; Liz Earle’s ‘Spot-On’ treatment. I used that before bed. Which one did the actual blemish-bashing? I have no idea! Back to the mask. (I’ll review the Spot-On separately when I’ve had the chance to apply it to a virgin pimple.) It smells a little like black olive tapenade, as previously mentioned, but I like black olive tapenade and so this isn’t a problem. It just makes me feel slightly peckish. The mask, strangely, doesn’t contain black olives, but does contain green clay to draw out dirt and oil, manuka honey to ‘soothe’ and other bits and pieces to protect, calm and balance the skin. It does all of these things extremely well. But it’s actually the texture of the mask that really stands out for me; not savagely thick and claggy like many clay masks, this one is surprisingly light and fresh. Deep cleansing treatments can feel quite aggressive, but I think that the addition of Manuka Honey and Aloe Vera to the ingredients keep the formula cool and soothing. I loved the little sponges that came with the mask – I have had quite a few facials where they have used sponges and I really like the feeling of them. They’re not so easy to use around the eye area, but then this mask isn’t to be used around the eye area! Because they hold so much more water than a cloth, you can effectively remove the mask and rinse the skin at the same time. I also splashed my face with a bit of cool water afterwards, because that’s the kind of gal I am. My skin has been outrageously clear for the past five days, and (without going into the gory details) it’s most certainly the time of the month when I should be getting blemish after blemish. My skin looks brighter and that’s just after two little goes! This shall be going into my pimple-fighting Battle Chest – it’s natural, affordable and it works. Next Post NEW Brilliant Urban Decay Launches!